“Legends never die” sings Julian Izard of the French band Existance in his rough but powerful voice and frankly you simply have to believe him – the legendary 1980s Hard Rock/Heavy Metal sound and the spirit of the finest bands of this era, from Judas Priest and Saxon to Dokken and Skid Row, are not going to meet their demise anytime soon. 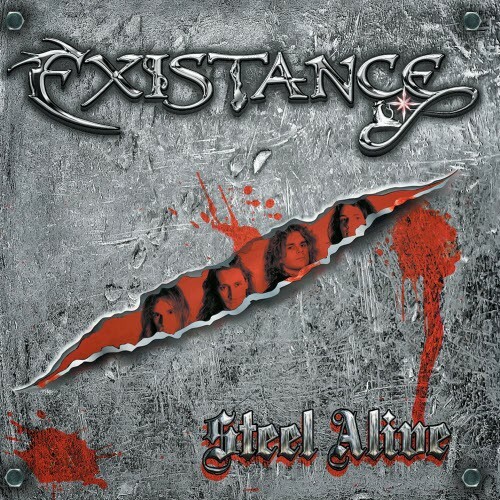 A living proof of this fact is Existance itself – their first album ‘Steel Alive’ is full of muscular riffs, equilibristic twin guitar duels, NWOBHM infused melodies and raw, high-pitched vocals delivered in Sebastian Bach-like manner. This album is the balanced combination of all the elements labelled “Classic” or “Traditional” Heavy Metal. From the guitar laden gallop of the opening ‘Legends Never Die’ or the aggressive group chant in ‘Dead Or Alive’ to the eponymous track driven by raw and rough double riffs – Existance’s sound is the mixture of Classic Heavy/Speed Metal which might as well have turned out to be a lost studio tape of any of the classic NWOBHM bands. The majority of the song structures on the album are similar – dynamic Metal anthems with strong choruses, dominated with twin guitar madness against the background of punchy rhythm section and yet, some stand out above the rest. Particularly interesting offerings include the Accept-esque ‘Close To The End’ and the fast-paced, furious ‘Slaughter’. Clichéd? Perhaps. Trite? Could be. But these are actually more compliments than accusations, as Existance knows well enough that bringing back Traditional Metal is the thing that they do best. ‘Steel...’ leaves no doubt, Existance is one of these bands you can only listen to when all-clad in denim and leather – bad news is that head-banging and fist-pumping practices while being clad in bunny slippers and baggy college t-shirts are a definite no-no (just ask your neighbours). 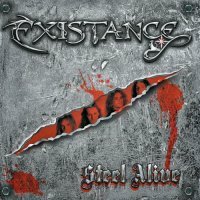 With ‘...Alive’, Existance prove that 1980s Heavy Metal is still – or, as they’d probably put it, “steel” – alive. Their youthful energy is backed with some serious musicianship and, at least partially, genes – Izard is a son of H-Bomb’s front-man Didier Izard, an important name to the French Speed Metal scene. The apple doesn’t fall far from the tree, it seems – so, if you wonder if the junior Metalhead managed to make his old man proud with ‘Steel Alive’, then I can recommend you check this out. Either way, if you’re into Classic Heavy Metal sound, you’re gonna end up blasting their music and I am sure you will enjoy it when you do!